Shanghai is bringing together stakeholders to advance green manufacturing. Climate change is indisputable, as is its impact on our planet’s invaluable but finite resources. Indeed, this is one of the most pressing paradoxes of our time: how do we strive for industrial growth while also being mindful of the traditional environmental impact of production? We must find the right balance. Everyone feels this urgency. The world is on a fast track to consume four Earths’ worth of resources by 2050. A recent United Nations report warned that CO2 emissions must be cut nearly in half by 2030 to safeguard the planet from additional threats of climate change. Without a doubt, the time for change is now. Green manufacturing, an emerging industrial trend with an achievable, long-term future for sustainability, addresses these environmental challenges at a systemic level. It answers the call to action. In short, green manufacturing is primarily about changing business and manufacturing practices, as well as the mindset of stakeholders, to mitigate the industrial impact on climate change and other environmental concerns. Green is not a hollow word. There are tangible ways to drive sustainable practices both within manufacturing facilities, across the supply chain, and through the customer base. The Fourth Industrial Revolution and industrial Internet of Things (IIOT) present new opportunities to unlock process innovations to develop sustainable, environmentally-friendly materials; decarbonize energy; tap digital innovation for doing more with less; and extend the life cycle of goods within a “zero waste to landfill” framework. ⦁ The building of a strong foundation for a global circular economy. There is significant potential to substitute carbon-intensive materials for less carbon-intensive ones. In the buildings sector at large, for example, it is possible to use timber or pozzolan-based concrete instead of Portland cement to mitigate pollution. It is also possible to improve materials processing systems. For instance, in addition to using greener electronic materials such as innovative bio materials, electronic companies can now incorporate green packaging. A case in point is wheat straw packaging, which can lead to a 40% saving in energy and a 90% reduction in water required for production. Companies can – and should – adopt eco-labeling to let consumers and end-users know where they stand. In Schneider Electric’s case, we use a Green label and tool for transparency on regulatory compliance, product environmental profiles, and end-of-product-life instructions. And in the coming years across manufacturing segments, look for blockchain advancements to improve green traceability. The huge payoff of a green manufacturing approach is energy savings. Here, environmental and business benefits go hand-in-hand. We see a bright future for decarbonizing energy. The latest Energy Transitions Commission (ETC) report “Mission Possible” declares that reaching net-zero CO2 emissions by mid-century is a very real vision. This goal can largely be achieved by the decarbonization of power and the electrification of processes. The cost of decarbonization can also be reduced significantly by constraining demand growth for carbon-intensive transport. With digitized process innovation, even energy-demanding industries such as concrete production can push toward more efficient, climate-friendly practices. China National Building Materials Group is a model in this regard, cutting energy use by 10%. Thanks to IIoT technology and the development of smart, connected devices, manufacturers can prioritize resource efficiency projects alongside productivity goals. Connected assets throughout a facility can yield insights into real-time and historical energy use, enabling industrial enterprises to streamline energy and resources from a bottom-line perspective. And when energy is among a company’s top expenses, this view of it is critical. Producing high-performance materials at Saint-Gobain’s plants, for example, requires massive amounts of power. Through digital innovation, Saint-Gobain has a realistic goal of curbing energy use and, in turn, cutting carbon emissions by 20% by 2025. Green growth is possible. For our part, Schneider Electric implements solutions across the life cycle of our own products to improve usage and extend their life. Schneider’s Smart Factory Program applies our own EcoStruxure™ solutions across our global supply chain to drive both operational and energy efficiencies. These also enable us to quantify the CO2 emissions of our clients to further reduce global emissions. Our aim is to avoid the release of 100 million tonnes of CO2 emissions between 2018-2020. But make no mistake: green manufacturing is about more than leveraging high-tech materials production and pushing for energy-efficient practices. It requires a fundamental change in the journey of goods. We know the traditional manufacturing journey is linear: a straight path from cradle to landfill in which products are made, used, and thrown away. Sometimes, they are never even brought to market. It’s time to reshape the status quo. 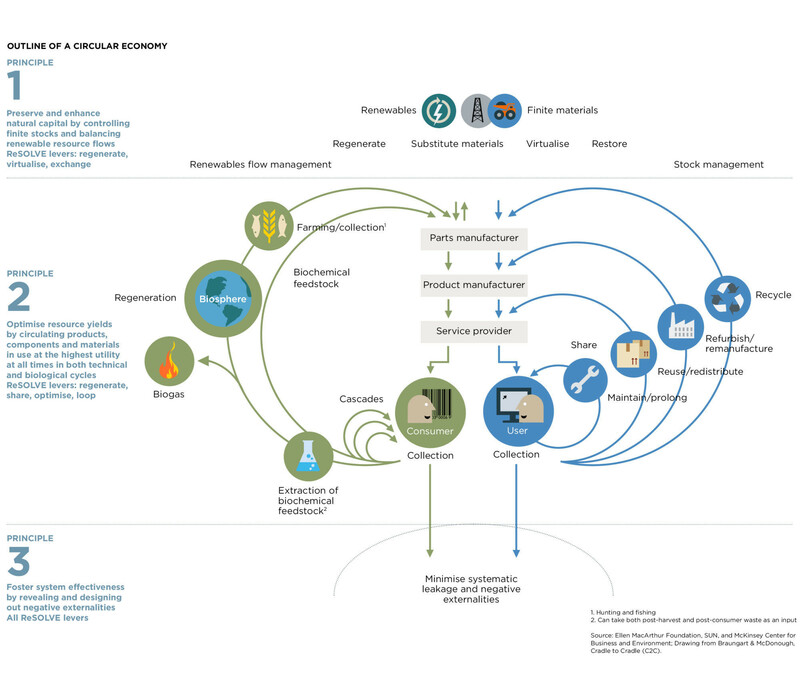 The green manufacturing journey, by contrast, is circular. It moves beyond the 3R approach of “reduce, reuse, recycle” toward a 5R approach: “repair, reuse, refurbish, re-manufacture, and recycle” thereby driving an optimized usage of the resources and an extended life of products. Achieving “zero waste to landfill” is possible. Schneider has committed to recovering 100% of our industrial waste at our 200 manufacturing sites by 2030. In addition to the environmental payoff, our circular business models have also resulted in 12% circular revenues and continued growth. Whirlpool, a global appliance manufacturer, has also adopted enhanced recycling practices and is on target to realize a three-year saving of $1 million. When it comes to making meaningful change, we all are in it together. An extended enterprise approach is essential. We can look to Shanghai as a model here. Aside from businesses, Shanghai is bringing together government and educational stakeholders to advance green manufacturing as a municipal priority. Shanghai is pursuing a strategic combination of R&D investments, partnerships with universities, local and multinational company collaborations, and innovation hubs to set ardent sustainability targets and – more importantly – take collaborative steps to achieve them. Shanghai also offers a deep talent pool, municipal commitment to green growth, private and public infrastructure for innovation ecosystems, and a strong foundation to develop next-era, sustainable manufacturing excellence. These measures have rapidly transformed the city into a green manufacturing hub we all can look to as a model. Let me be clear: green manufacturing is simply good business. It offers revolutionary advances in productivity and efficiency without the downsides of waste or pollution. Economic growth can and must be decoupled from environmental degradation. The true power of green manufacturing will reveal itself when the entire industry begins to detach one from the other, thus accelerating the planet toward a low-carbon reality. This green mission is possible.